Points Nécessaires : 18550 Software is not compatible with mobile and tablet devices. Please add this title to your Wish List and sign on to your the first club account from a desktop computer to complete your redemption. 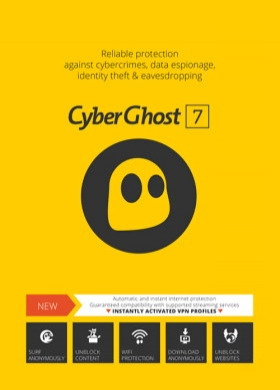 ABOUT THE SOFTWARE Surf the Internet freely, securely, and anonymously with the world’s most trusted VPN service: CyberGhost VPN!Used and loved by more than 10 million people, CyberGhost offers access to over 800 servers in 30 countries, including US, UK, Germany, France, Australia, Canada, Japan, Singapore or Iceland. Unblock content you love, browse safely and protect your online privacy … only with CyberGhost VPN!Use it for: unrestricted access to blocked content, safe online browsing, protecting your online privacy, ad-free browsing, fast and easy installation.Apps for Android and iOS included. Usable on 1 device for Premium and 5 devices for Premium Plus. KEY FEATURES	No logs Unlimited Bandwidth AES 256-BIT Encryption Unlimited Traffic NoSpy servers (own servers) No Ads Data compression Protection against malicious websites Force httpsSYSTEM REQUIREMENTS	Minimum System RequirementsHardware 1 GHz PC 32-bit (x86) or 64-bit (x64) processor 2 Gigabyte RAM (depending on your running Windows operating system) 200 Megabyte free hard drive space (180 MB less, if Microsoft .NET 3.5 SP1 is already installed) CD-, DVD- or Blu-ray-Drive (optional for boxed version) 1024 x 600 pixel screen resolution, High Color or True Color Mouse, Trackball or similar Correctly installed and preconfigured Internet connection Software Windows 7 (32/64-bit), Windows 7 Starter Windows 8 (32/64 Bit), Windows 8.1 (32/64 Bit) Windows 10 Microsoft .NET Supported are also the native protocols OpenVPN, L2TP/IPSec and PPTP.Since Windows XP (32 and 64-bit) is not supported any longer by Microsoft and will not be updated any more against security leaks, CyberGhost will end its support as well and end all compability efforts beginning immediately. Users are asked to update to a modern Windows platform.Please note that Microsoft stops delivering security updates for Windows Vista, beginning April 11th, 2017. From that day on CyberGhost also stops supporting Windows Vista, for it must be considered then as insecure as well.